Sara and I were chatting the other day and she was talking about how she tries to post at least 1 crafty thing a month. And I laughed because, as so many of you know, I am so not crafty and if I tried to post 1 crafty thing a month, we’d be getting a lot of rude mail. So, with the exception of a certain disaster wreath that we’re not going to talk about, if I do something crafty, I promise that it’s going to a) be easy, b) be fun, c) totally doable in an hour or less. Because I have CADD (Crafting Attention Deficit Disorder). Also, chances are good that it’s going to be easy to clean up because I don’t like to clean up in the best of circumstances, let alone a floor full of straw and a table covered in marshmallow peeps. Oops. We weren’t going to talk about that. 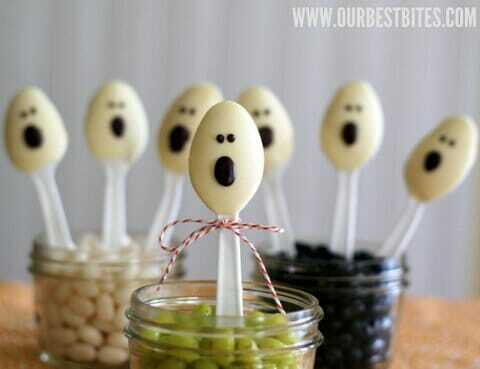 These are so cute and so easy. You can make a whole bunch of them in a short amount of time. If you’re careful, you won’t even get chocolate on your hands. You can dip the finished product in hot chocolate or (and more likely in my case), you can nibble the chocolate straight off the spoon. When your 5-year-old daughter comes home from school and sees what you’ve made, she’ll shriek, “Those are soooooo cuuuuuuute!” And then she’ll proceed to dip into your Sharpie stash and decorate 100 plastic spoons and try to sell them to her brother while you nurse your baby. I swear to you all, she is my parents’ revenge. 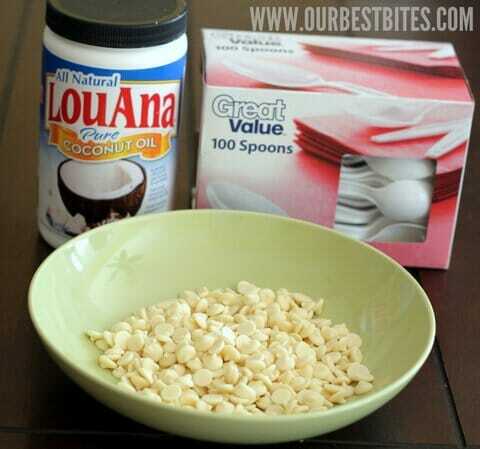 For the spoons, you’ll need plastic spoons, white chocolate, and coconut oil. 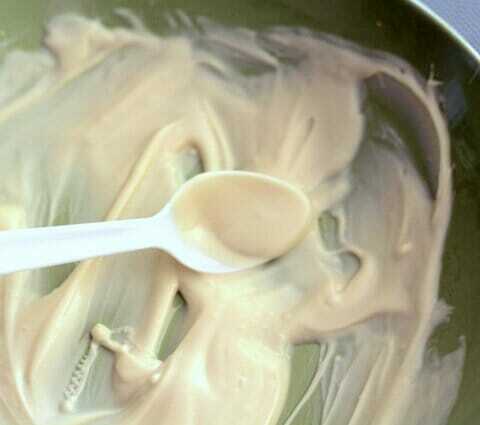 and heat for 20 seconds at a time, stirring at each 20 second interval, until the mixture is melted and smooth. If you prefer the chocolate to be a little bit thinner, you can add up to 1 additional teaspoon of oil. 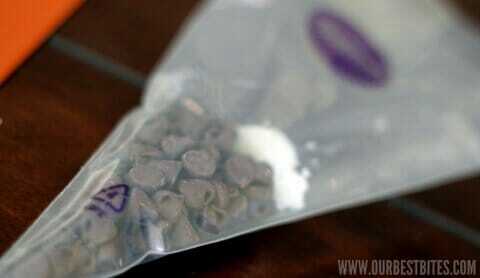 Dip each plastic spoon into the chocolate. I scooped a little up and then rolled the spoon over so the chocolate dripped down the back of the spoon. 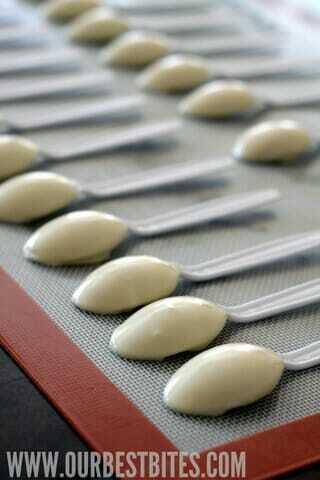 Place the spoons, back-side up, onto a sheet of waxed paper or a silicone mat. 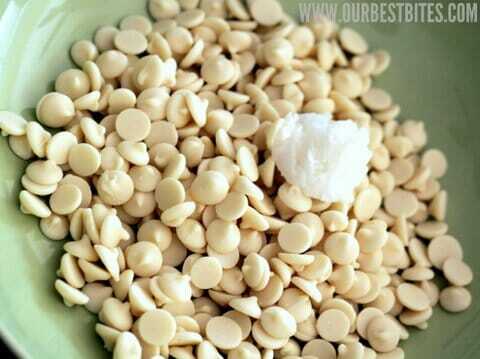 Allow the white chocolate to solidify. When the spoons are solid, place some semisweet or dark chocolate chips and oil into a cake decorating bag or a heavy-duty Ziploc bag; you’ll want 1/2 teaspoon oil for every 1 cup of chocolate chips. Same story; heat for 20 seconds at a time, mashing the bag at the end of each interval, until the mixture is smooth. Snip off a tiny part of the tip (or the corner) of the bag and dot each spoon with 2 eyes and then fill in an oval for the mouth. Allow to harden. You can wrap these in cellophane treat bags and tie with a ribbon or just place them handle-down in jars of jelly beans or dried beans. This is my kind of craft too! This is my kind of craft! The amount of cuteness is more than the amount of work and my kids could totally help make them. I’m going to add it to our list of fun things to do when they are out of school for Columbus Day. Super cute. Just fyi on a non-food note, pure coconut oil (cold compressed is recommended) can be used for a baby’s diaper rash instead of otc creams. I have also heard it can be used as a sunblock as well. Pretty cool stuff. So cute! For some reason I get super giddy about Halloween treats more than any other holiday! Maybe it is the cool temperatures! I have CADD as well. I also find I have anger management issues when it comes to crafts. Which is why I have a drawer full of unfinished crafts. These are adorable! Those are really adorable and it’s so worth it when a little one gets excited about something you’ve made, isn’t it! Congrats on all of the success with your book, really exciting to see it on the best seller list! Oh my gosh. Coolest Halloween craft ever! Doin’ it! I am definitely making these!! My daughter turns 3 this month and I am going to do a Halloween theme. (I know, I know! So creative!) Anyway, so far all of my ideas are coming from your site – so, they’re really your ideas… 😉 Thanks!!!!!! Very cute, simple but awesome!!! These are adorable! 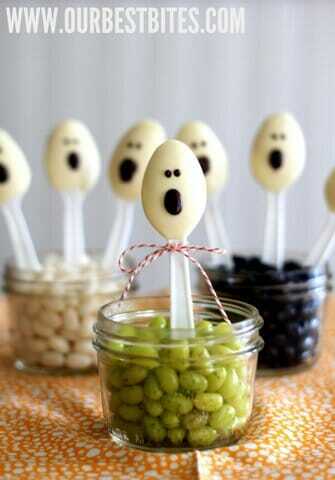 I might make these and bring them to work with me on Halloween! A little morning treat! These are too cute! Now I just need to adapt them into Christmas so I can give them away with my hot cinnamon milk! How about snowmen? black eyes and something to look like a carrot nose. Then tie a ribbon or yarn around to be a scarf. For Christmas you can do them in regular chocolate then add 3 small marshmallows, dot with eyes, etc for a snowman look or dip in chocolate (white or reg) and then sprinkle crushed peppermints on it. So cute! I can’t wait to try these! Is this what the “obscene amount of jelly bellies” was for? Or just a creative use of the excess? I love this craft. Oh these are adorable… and something that I can easily adapt to make for my daughter who needs sugar-free. THANKS!! I’m guessing they come out shiny because of the coconut oil. Right? So cute! !